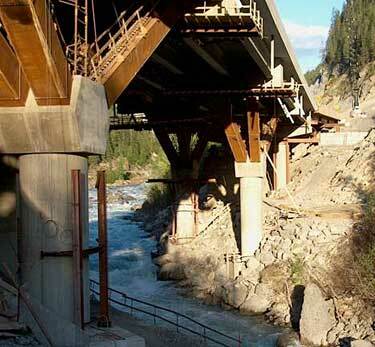 Structures such as bridges and power transmission towers founded on rock may be located on steep slopes. Design issues for these conditions where the structural loads are highly concentrated, include the bearing capacity and stability of the foundation. Additional factors that can be detrimental to stability include ground motions due to earthquakes, and scour where there are high velocity flows at the foundation. Types of foundation include spread footings, rock socketted piers and tension foundations. Assessment of scour potential and design of appropriate protection measures.